All Photography and Retouching is based on time at the studio. Rates are £75 first hour and £60 per hour after this. A full 8 hours day is discounted to £440. All time in the studio is included, including set up, photography, and retouching. As it is hard for new customers to understand what can be done in an hour I also have estimate price per item based on past experience, but these are estimates as all work based on time. Prices can be as little as £2-3 per item including retouching, but please see relevant photography prices above. 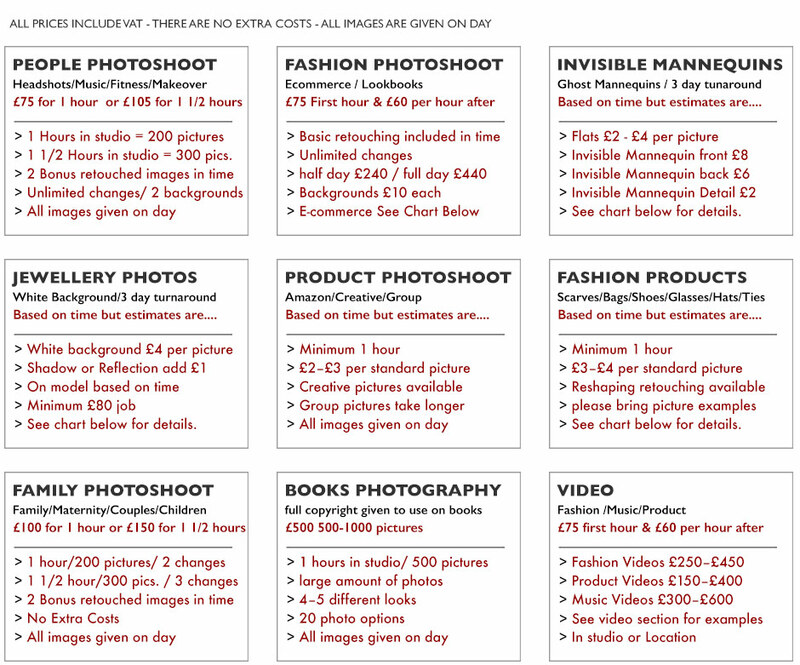 Please note these prices are for standard photography of this website and sometimes if you want Hi-end Images you will need extra time for the photos and retouch. Also the larger the quantity the cheaper it becomes. To get these prices we need to be efficient with time so the client should bring along examples of what they want on phone, and help lay out the item as i photograph and retouch. This way it will be cheaper and more cost effective. Work in the studio is always paid on the day. We take cash, bank transfer before or on the day, and also debit and credit cards (cards have 3% transaction charge added on all amounts). 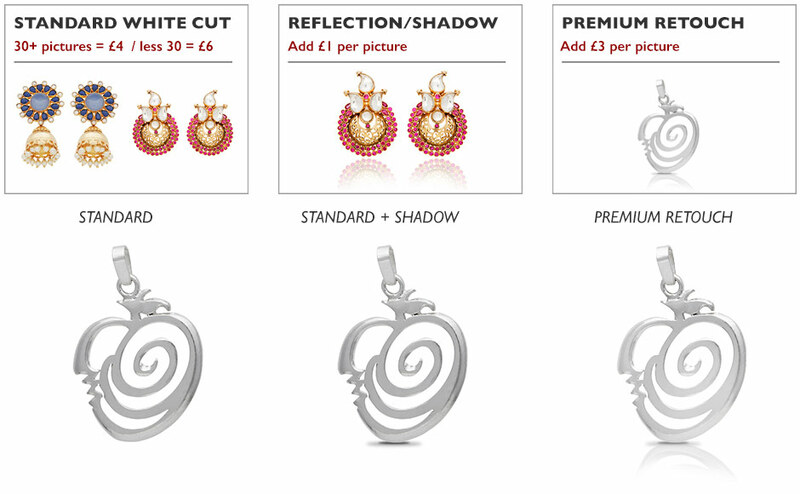 You receive all the images on the day – Mannequin and Jewellery photography have a 3 working day turnaround. In these cases you pay for time at the studio and then the extra retouching cost after delivery of images. All work is based on time £75 first hour and £60 per hour after that. For a model option minimum 2 hours booking, model cost is £90 for first 2 hours then £35 per hour after. Price estimates below are usually accurate and work out the same as time based work. They are there so you can estimate final cost. More than 30 items the costs below will be significantly less. All work is based on time £75 first hour and £60 per hour after that. Price estimates below are usually accurate and work out the same as time based work. They are there so you can estimate final cost. Any steaming must be done at same time so please bring 2 people one to help dress mannequin and the other to steam if needed. Please note with see through parts of clothing /shear parts you have choice to see mannequin or not through the shear, as shown below ADVANCED MANNEQUIN. If you keep mannequin it is still £8 to retouch the mannequin out takes longer so the cost per picture is £12. Please click here and look at bottom of page for examples. Jewellery is based on time but generally works out on white are £4 or £5with reflection or shadow. For this price we shoot the items, cut them out to as white background, and enhance colours and lightness. Please note different types of jewellery comes out differently, we do not remove reflection,shadows, defects as all jewellery get these and to make perfect is hi-end retouching which can be done but costs extra. Please see jewellery section for examples of the work we do – these were all £4 or £5 per picture. Jewellery on black, or natural surfaces not white or on a model is based on time £75 first hour £60 per hour after that. Retouching of any defects are extra. Prices are based on time but 90% of time they will be as below.